Household food insecurity, inadequate or insecure access to food due to financial constraints, is the subject of the latest annual study published by the University of Toronto research group PROOF. This latest report confirms that number of Canadians having trouble putting food on the table remains unacceptably high, at 3.2 million (or 12 per cent of households) in the nine provinces and territories for which we have data. The data were collected in 2013-2014 as part of the annual Canadian Community Health Survey. British Columbia, Manitoba, Newfoundland and Labrador, and the Yukon chose not to include the food insecurity component in their survey, leaving us with no data on food insecurity for their populations. This unfortunate choice impedes our ability to document the challenges Canadians face around food access. 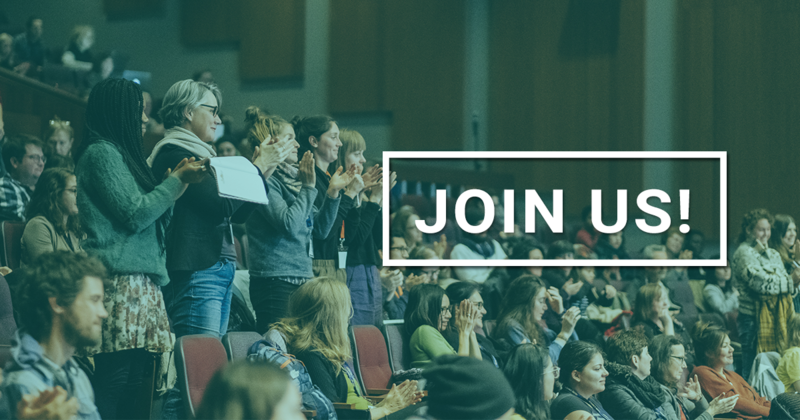 Food Secure Canada stresses the importance of PROOF studies and shares the conviction that food insecurity is a public health issue that significantly affects the health of Canadians and drives up healthcare costs. 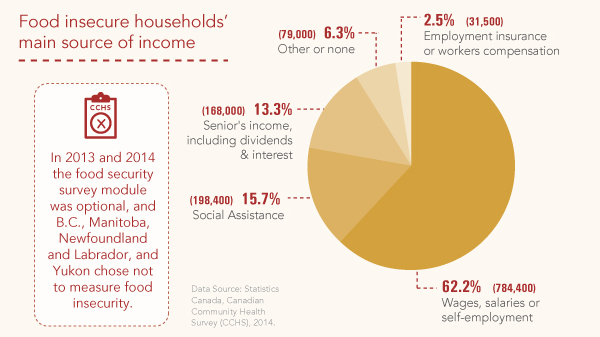 While 60.9 per cent of households whose major source of income was social assistance were food insecure, the majority of food insecure households (62.2 per cent) were reliant on wages or salaries from employment. “We know that social assistance recipients are particularly vulnerable, and the latest numbers show rates of food insecurity as high as 82 per cent among people reliant on social assistance in Nova Scotia and 83 per cent among those in Nunavut. At the same time, we shouldn’t lose sight of the fact that the majority of food insecure households in our country are working families,” says Naomi Dachner, co-author of the report. Despite the complexity of causes and experiences, the main factor of food insecurity is poverty. 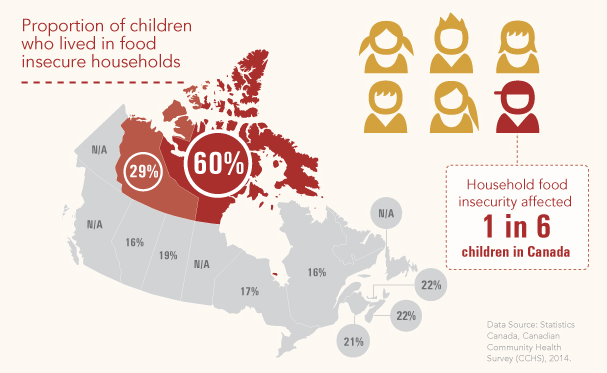 Food Secure Canada believes that public solutions to this problem should focus on household income. Households with children under the age of 18 were at greater risk for food insecurity than households without children (15.6 per cent versus 10.4 per cent). The most vulnerable were lone parent families headed by women at 33.5 per cent. Single adults are also suffer disproportionately of food insecurity (15.7 per cent), as has been recognized by many Canadian food banks. Nunavut and the Northwest Territories had the highest prevalence of children living in food-insecure households at 60 per cent and 29 per cent, respectively. Indigenous communities in Northern Canada are experiencing a food security crisis with serious implications for health and well-being. 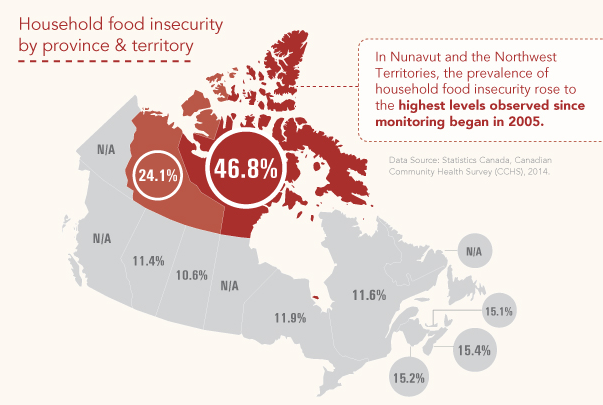 Food insecurity in Nunavut remained extraordinarily high, with a prevalence of 46.8 per cent in 2014 and 19.3 per cent of households experiencing severe food insecurity. The second highest prevalence (24.1 per cent) of food insecurity in the country in 2014 was in the Northwest Territories. Food insecurity in Canada is highest in the North and the Maritimes. Rates across the rest of the country are above 10 per cent.